Only Online Submissions are accepted for Journal of Orthopaedic Case Reports. Registration and login to SCRIPTURE is required to submit articles to Journal of Orthopaedic Case Reports and to check the status of current submissions. Please keep in mind to Ensure a Blind Review have been followed. For this purpose the main article file should not contain authors name, or reference to authors institution. A title page with all the details of Authors and Institutions needs to be submitted separately. Please refer to Authors Guidelines for more details on article submission. Please use articles already published in the Journal as templates for preparing your manuscripts. 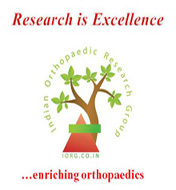 Authors Fees: Journal of Orthopaedic Case Reports is a non profit, Self-funded body. To keep our Journal open access and to make it available free of charge, the authors and the organisation share the responsibility. The article processing charges are shared by the authors and the organisation. For every article publication the authors will be required to pay INR 7000 (250 $ for international submissions). This will be used for processing the articles, proofing, copyediting and online hosting and will also support the print copy of the article. The charge is applicable to accepted articles only and submission and peer review of the article does not require any payment.